If you ever strolled down Shoreland Avenue in Whitefish Bay, a suburb outside of Milwaukee, you might have noticed a little old brown house where the front drapes are never closed. Vera Klauck liked her home that way. You might have even seen her perched on her couch staring hard at the towering maple trees that leave a symmetrical trail down Shorewood Avenue and her magnificent rose garden that left the neighborhood in awe. Oh, once in awhile her eyes softened when the neighborhood boys kicked a soccer ball into her flowerbed of petunias and roses. The petunias always seemed to survive the blows, but the bright red roses were not so fortunate. She never scolded the children who didn’t think twice about the disturbed bed of roses. Her late husband – quite the opposite of Mrs. Klauck – always appeared frustrated with the boys who were not blessed with neighborly manners. He wasn’t bashful about letting out a few choice words to scare the boys, which prompted Mrs. Klauck to gently remind her husband to have patience with children. She had faith that the boys would be moved in their own time. On this particular spring Friday she smiled as the boys giggled when they tip-toed nervously to retrieve their ball, leaving behind a crushed and broken rose that needed a little help. 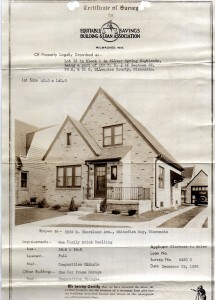 This is Lillian Maier’s house on Shorewood Avenue in Whitefish Bay, Wisconsin. “Just a beautiful day, Mr. Barry,” she said nearly out of breath. She then carried the single rose to her kitchen table where a blue antique vase waited. She placed the rose into the vase and let it drink some cool water. And then hooked up her tank and let go a wondrous sigh of relief. The neighborhood boys reminded her of some 60 years ago when her son did the same thing. She always phoned her son after the boys finished playing. He was always too busy to talk. He was struggling through a divorce, a second marriage, a new job and seven hungry children. Mrs. Klauck understood. She never would say it, but last month the emptiness of her son’s telephone conversations was especially hard on her. The one-word answers, the lack of details and rushing to end the call made life difficult. All she wanted was some advice. Mrs. Klauck developed a nagging cough and wondered if she should see a doctor. In 85 years of living she never had a reason to see a doctor because she rarely got sick. For years, a homemade meal, a leisurely walk and the smell of fresh plucked roses were all she ever needed. At first, she convinced herself a doctor was not necessary. Then the cough worsened and painful breathing spells soon followed. She was scared. Something was wrong. Even a gust of wind that carried the fragrance of her spring flowerbed into her home turned on her and encouraged coughing spells. She longed for her late husband but sought comfort in my grandma Lillian Maier, who lived alone across the street. When the cough was getting worse, Grandma Lillian convinced Mrs. Klauck to see Dr. Tom Featherston, known for kindness and gentle manner when treating seniors. When Dr. Featherston finished examining her, portable tubes were pumping oxygen through her nose. She again breathed painlessly. Dr. Featherston said it was only a temporary solution. Mrs. Klauck would have to wear the medical apparatus for one month. By then time would have taken its course. Her son wanted to put her in a nearby hospice, saying it would be her new home and new friends, but she would have none of that. She would have to give up watching the neighborhood children and her beloved rose garden. With spring promising new life, she decided home is home. Dr. Featherston understood. Mrs. Klauck liked him. He was an “old fashioned” doctor, she would tell Lillian. He would make house calls once a week – and not charge her. Mrs. Klauck joked with Grandma Lillian that maybe the doctor had a crush on her. 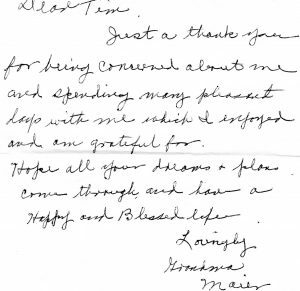 During that long month, Grandma Lillian phoned Mrs. Klauck or stopped over to see if she needed anything and sometimes just let Mrs. Klauck talk. My grandma’s greatest strength was listening – a key she said to long relationships and long marriages. She was always there to listen. When it became difficult for Mrs. Klauck to breath, Grandma Lillian cooked up a batch of warm potato soup and poured it into an old apple sauce jar. She would label the soup because Mrs. Klauck had so many jars of food in her refrigerator that it became difficult to remember what was in them. Grandma Lillian always had soup around. In her basement you could find a storage closet with various foods that ranged from canned goods such as Campbell’s Chicken Noodle Soup to a can of Jolly Green Giant beans. The depression had taught her to stock up with food – just in case. My grandmother was close in more than distance to me. I would take her weekly shopping at Kohl’s grocery story. She loved to cook and loved to feed empty stomachs with a watchful eye on whose plate was empty and who needed a second helping of mash potatoes or her special cinnamon apple sauce. She was just there whenever I needed someone to talk about – be in school, careers, girlfriends, and marriage. She read everything I wrote. I know because she’d ask me questions to help me become a better journalist. She loved a good mystery and she loved history – both of which I incorporated into a lot of my work. Our lunch conversations frequently turned to politics and books over a game of Gin Rummy. I was raised in a family of die-hard Republicans who held Nixon parties while I sat in my room watching Laugh-In and the Smothers Brothers. My grandmother was no fan of Nixon and loved JFK and everything he stood for. She was tired of the old politicians and wanted the younger generation with fresh ideas to lead the country. Lillian would pass away a few years after she moved to Colorado. After her death, this note was found in her belongings. Her home welcomed everyone. She was one of the first homes to have a colored television set in the 1960s and food was abundant to her family, their friends and neighbors. But like the season her life chapter was changing all too fast. Boxes were now scattered inside her home. She would move to Colorado to a retirement home. She had hoped her home would be my home when she was long gone. But it wasn’t to be. I was leaving to the East Coast to become a writer, a husband and father. On that spring Saturday, she carried the potato soup over to Mrs. Klauck and planned to stay until nightfall. Mrs. Klauck had been wearing a warm hand-knit sweater. “You look beautiful today with that sweater,” she told her. Mrs. Klauck’ sister Esther Weeks had flown in from California to lift Mrs. Klauck’s spirits. Grandma Lillian was so happy that Mrs. Klauck had family around to be there at the end. But Ester couldn’t stay. She said she didn’t bring enough clothes to wear. Mrs. Klauck didn’t complain. She still had the boys playing outside and Mr. Barry walking his two Siberian huskies and the beginning of new life in her rose garden. It was spring and she inhaled it all. This was her daily television show – only it was real and warm. She refused to let herself or others dwell on her health. Dr. Featherston had warned Mrs. Klauck that it would soon spread to her esophagus. She would no longer be able to eat. Still, Mrs. Klauck on Saturday mustered enough courage to swallow a teaspoon of potato soup. It was a painful swallow. “It is good,” she said as a thump shook the house. The boys kicked their soccer ball again into the rose bed. Grandma Lillian told Mrs. Klauck to stay put. She would get the clippers and check the damage as the boys ran off guilty as charged. Sure enough, a single rose lay helplessly on the ground. She snipped the rose and carried it in and placed it with the other rose looking more beautiful than it did the day before. “Three days of beauty,” Mrs. Klauck said. “Then tender as you go,” the two women said in unison. Grandma Lillian looked out the screen door lost in thought. She had the same stare when her husband passed away in 1970. “All of it will be gone tomorrow,” she told Mrs. Klauck, who knew her close friend was saddened by the move. Nightfall came and Grandma Lillian returned home to pack her final belongings and found it difficult to sleep. Her son would be here Sunday to drive her to Colorado. I had left for the East Coast with my new bride. It was hard leaving that Whitefish Bay home because I envisioned living there some day. But the home served a fitting purpose. It was where my wife Suan and I had our rehearsal dinner – first shared our vows that planted our lives together. On Sunday morning, Lillian got into my father’s car as an ambulance stopped at the little old brown house. The neighborhood fell silent and the boys stopped kicking their ball. As the ambulance pulled away, somebody closed the front drapes. “How many days does it take before I move into my new home? Grandma Lillian asked as my dad put the last box in the car. “Three days,” he said, figuring it would take time to get all the paperwork together. “Three days of beauty,” she said softly, after the boys across the street accidentally kicked the ball into Mrs. Klauck’s rose garden. A little boy ran up to retrieve the ball and when he picked it up, he noticed a single rose resting helplessly among the other flowers. It wasn’t quite broken. He paused for a moment. He started to run away but stopped quickly and turned around. He touched up the soil and replanted the rose in its original home. Mrs. Klauck would have liked that.